a few moments. Then up home. I intended going over to Woolf to take the car. It was so cold and snowing that I went back to town. Came home at 4.15 I got supper did the evening work. Then read and knit a little. Thursday February 27 1908 I was busy with the house-work all forenoon and in afternoon took my knitting and went down to [Mrs Millers?] Will was down to Woolfs awhile. I read in evening and I wrote to Lydia. I had a long letter from Lou Reeves Simpson Friday February 28 1908 Will went to town early this forenoon. I did not have quite so much house-work so I got quite a lot of work done on my waist. I nearly finished it. I read and knit in the evening. A cold N.E. wind. Feels like a storm. 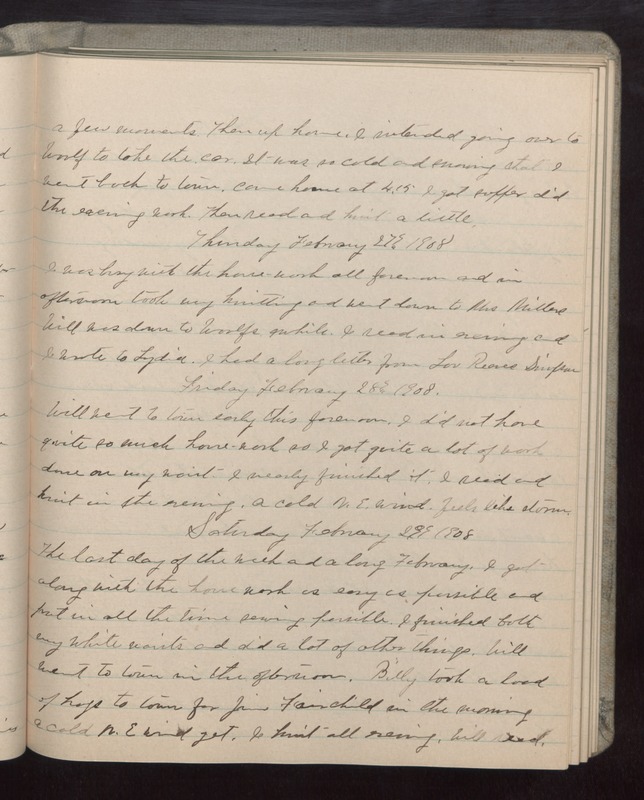 Saturday February 29 1908 The last day of the week and a long February. I got along with the house work as easy as possible and put in all the time sewing possible. I finished both my white waists and did a lot of other things. Will went to town in the afternoon. Billy took a load of hogs to town for Jim fairchild in the morning a cold N.W wind yet. I knit all evening. Will read.